What Does A Promise Ring Mean To You? The origin and history of the promise ring is rather unclear, but the meaning of promise rings has remained the same regardless of time and place. Put simply, a promise ring is any ring that symbolizes a promise or commitment between two people. Typically a token of romance, promise rings also demonstrate friendship, chastity, and loyalty. Today, the most common meaning of a promise ring is a commitment to a future engagement and marriage. 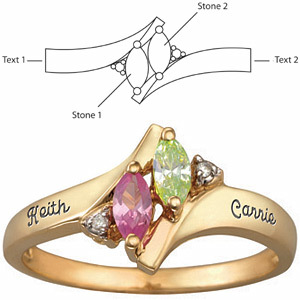 Today, more and more couples are choosing to engrave their names or special messages on promise rings. 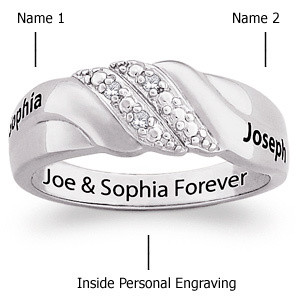 Joy Jewelers offers a wide selection of engravable promise rings. 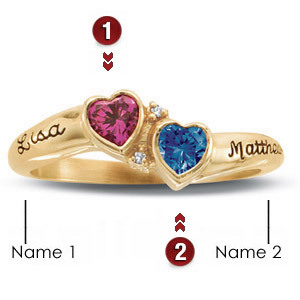 If engraving is too bold for you, consider a birthstone promise ring. Each birthstone promise ring features two birthstones, one for each person. Traditionalists choose petite diamond solitaire rings to express their commitment. Promise rings are available in sterling silver, yellow gold and white gold. The first step is to obtain the ring size. Buying a ring that is too large poses its own problems, but you can minimize misunderstandings by ordering the correct ring size. Then plan ahead: many of our personalized promise rings are handcrafted to order, and require one to two weeks to be produced. Then decide the style of promise ring that best represents your commitment. Also, choose a metal type that fits with your apparel and existing jewelry. For example, if you wear yellow gold earrings and necklaces, you should consider a yellow gold promise ring. And finally, choose a promise ring style that suits your taste and lifestyle.